There’s the Board of Supervisors, Loudoun’s seven Town Councils and dozens of community organizations that all come together to discuss and take action on some of the biggest dilemmas that Loudoun’s 400,000 residents face. But much less well known is a powerful group of seven that leave their seats at the head of the table once a month to learn more about what’s going on in their neighbors’ backyards. Leesburg Mayor Kelly Burk, Middleburg Mayor Bridge Littleton, Lovettsville Mayor Nate Fontaine, Purcellville Mayor Kwasi Fraser, Round Hill Mayor Scott Ramsey, Hamilton Mayor Dave Simpson and Hillsboro Mayor Roger Vance have been meeting once a month since last July to do just that. 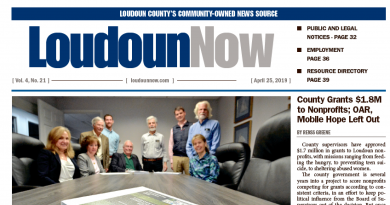 Together, they’re the Coalition of Loudoun Towns—a non-legislative group that share suggestions and collaborate on challenges their towns face, individually or collectively. COLT was formed in the early 1990s but had largely been inactive for several years until Fraser and then-Lovettsville Mayor Bob Zoldos led a push in 2015 to revive the group. For the next three years, the group met on an as-needed basis, with regular monthly meetings returning to schedule last summer following the May 1 town elections that saw Fontaine and Littleton elected for the first time. The mayors said that it was Envision Loudoun—the county’s effort to rewrite the Comprehensive Plan, and its draft proposals to increase development in the county’s rural areas—that prompted the more frequently meetings. “The pressures of development and threats to our quality of life of western Loudoun are only increasing and our citizens need all the voices of representation it can get, now more than ever,” the mayors wrote in a joint statement. At the most recent COLT meeting on Feb. 15, which was held at the Loudoun Museum in Leesburg, the mayors decided to draft a letter to the county’s Planning Commission and the Board of Supervisors rejecting the commission’s recommendation to allow the construction of an additional 20,000 homes and 10 million-square-feet of commercial space in the county’s Transition Policy Area. The mayors pointed out that increasing development by that much in that area would add enough square footage to build three Pentagons. “This is not in keeping with the vision of the TPA as a spatial and visual transition between the urban east and rural west … and is the start of the eventual destruction of our fragile town communities and rural Loudoun,” they stated. Staying involved with updates to the county’s Comprehensive Plan and other issues affecting Loudoun’s rural countryside has always been an integral part of COLT’s mission. Just a few years after the group formed, it found itself keeping up with the Loudoun County Rural Economic Development Task Force as it worked on “The 200,000-Acre Solution,” which proposed many of the policies that set the stage for the growth of the rural economy as a land conservation strategy. 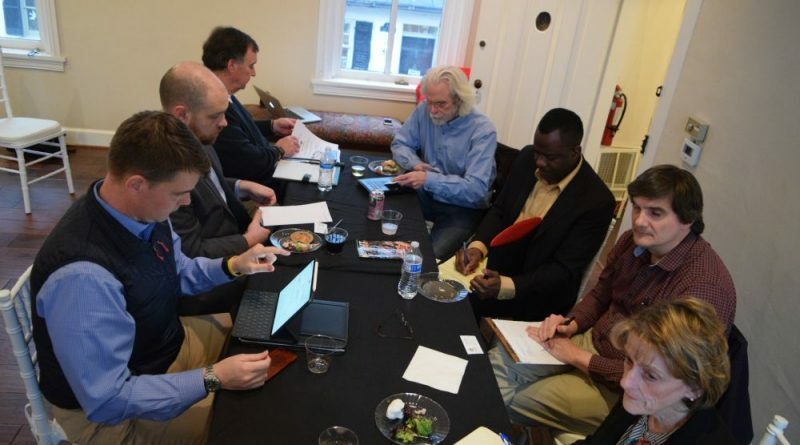 Hillsboro Mayor Roger Vance, Purcellville Mayor Kwasi Fraser, Round Hill Mayor Scott Ramsey, Leesburg Mayor Kelly Burk and Hamilton Mayor Dave Simpson toss around ideas at the Feb. 15 Coalition of Loudoun Towns meeting. 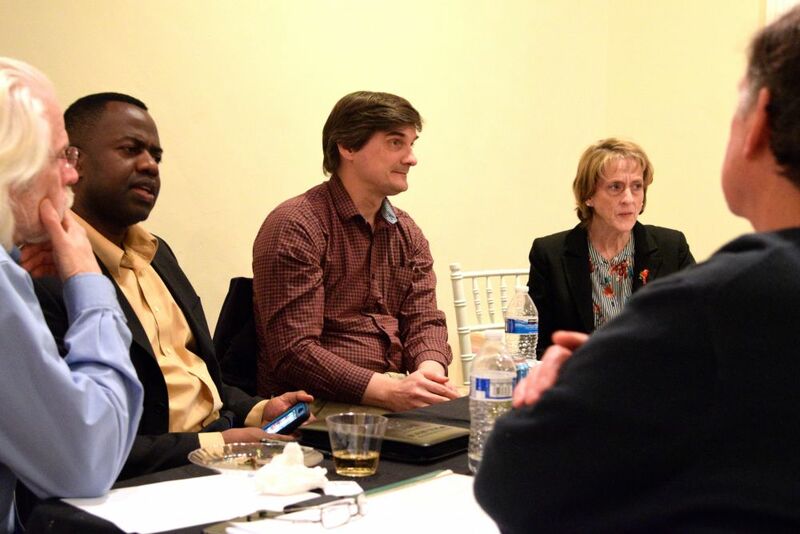 While the county’s Comprehensive Plan rewrite has been the driving force behind the group’s meetings, the mayors also convene to address and seek help with any issues their towns might be facing. During the February meeting, one of those concerns came from Simpson, who was worried that a dirt and debris stockpiling operation near Hamilton was contaminating water and flooding Rt. 7. Once concerns like those are brought to the table, the mayors determine whether they can work together to find a resolution. As for Simpon’s concern, the mayors agreed to write a letter to the Board of Supervisors calling for the board to “fully investigate and immediately shut down the operation” if it finds any illegal activity and to amend the county zoning loophole that allowed for the operation in the first place. In a way, COLT is a support mechanism for Loudoun’s towns. The group has the advantage of presenting a unified voice that could be more influential than the towns individually. In addition to discussing Envision Loudoun and other areas of individual concern, COLT meetings manifest themselves in different forms each month. During the February meeting, the mayors had the chance to provide the Loudoun County Chamber of Commerce with input on which topics of interest they felt are most important to their towns. Grafton deButts, the chamber’s vice president of membership and government affairs, learned that the towns face the same issues of economic development as those living elsewhere in the county. DeButts said he found that while the Town Councils bring “so much to the community,” their impact is often downplayed. “Nobody is really talking about them,” he said. The mayors also acknowledged that the ways of promoting economic development differ from town to town, just as their histories and overall communal interests differ. Littleton said that economic development, specifically in the eastern part of the county, tends to be focused on data centers and Metro. He said that Middleburg doesn’t have the tools that places like Arlington does and that it needs to look at economic development a bit differently. Fraser said that economic development doesn’t necessarily mean more residential rooftops, but that it can. In Purcellville’s case, he said the focus is on supporting existing and bringing prospective town businesses. DeButts agreed, labeling the subject Fraser spoke of as business development. While COLT’s members have changed multiple times throughout the past three decades, the discussions it cultivates aren’t all new. Elaine Walker, Lovettsville’s mayor when COLT was created, said the group began meeting on a fairly regular basis in the early 1990s to do exactly what it does now—give Loudoun’s mayors the opportunity to ask for help with issues their towns face. “It was just more or less a time of sharing,” Walker said. And in the ‘90s, the towns shared a lot. Not only did Lovettsville share a zoning administrator with Leesburg, but it also was given a pump truck by the Town of Round Hill to help with its sludge removal. A trolley ran between Lovettsville and Purcellville to give residents access to shopping and other amenities. Bob Lazaro, a former four-term Purcellville mayor and once a COLT chairman, said that when the Purcellville was rebuilding after a fire at its Basham Simms Wastewater Facility, Leesburg provided some of the materials needed to get everything back in working order. “That’s the value of living where we live … and understanding that we’re all in it together,” he said. The group faded a bit, though, following mayoral turnovers in several towns. In 2012, Walker stepped down after serving two decades. Two years later, Lazaro did the same after eight years in Purcellville and Greg Wilmoth left his post as Hamilton’s mayor after four years. Loudoun’s top town representatives are scheduled to meet again on March 13 during The State of Loudoun’s Towns event, hosted by the Chamber of Commerce, to address economic development, quality of life and transportation. It will be the first time all seven of Loudoun’s mayors will share the stage at a chamber meeting. The group plans to hold its March meeting immediately following the event. As for the Board of Supervisors’ tentative July 2 adoption of Loudoun 2040, the mayors of COLT said they have no plans of dropping the issue and pledged to stay involved as the county begins implementing the plan.